Kányinsọ́lá Ọbáyàn is a doctoral candidate in Africana Studies at Cornell, an Ivy League research university in Ithaca, New York where her research examines the relationships between the Lagos startup ecosystem migration and the larger urban environment. Obayan is also founder of a 501(c)(3) nonprofit organization, Orísun Collective Inc., which holds summer camps in the creative arts for secondary school students in Lagos, Nigeria. She is passionate about arts and culture, social entrepreneurship, and economic development on the African Continent. For my business, I wanted a name that reflected my passion for the African culture. I also wanted something meaningful. After a brainstorming session with my father, I came up with the name Orisun, which means ‘the source’ or ‘beginning’ in Yoruba. I then spoke with several individuals who would later become members of my team and the “collective” part was later added on to it. Who or what inspired you to start this idea? December 2015, I was having brunch with some friends and I had informed them that I would like to start a school for the creative arts in Nigeria within the next seven to ten years. My friends were very supportive but at that time it was simply an idea and I didn’t know how to implement it. However one friend in particular, who is now an advisory board member gave me the push I really needed to start. He encouraged me to work on the idea right away. 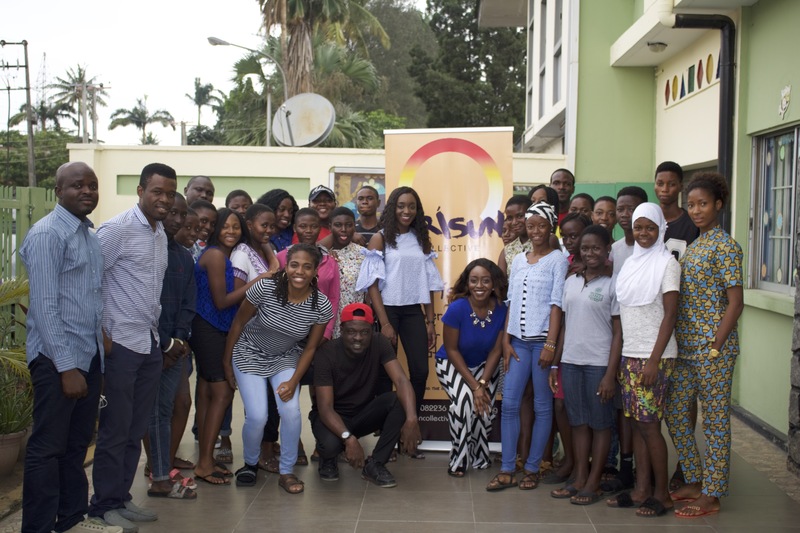 He said, “why don’t you start a summer camp in the meantime to get the traction you need until you can afford to build a school.” And that was how Orisun Collective was born. My target market is secondary school students ages 10 to 17. As a nonprofit, we have mainly relied on crowdfunding, individual donations, and grants. Right now, we are pursuing different funding methods to include: monthly giving programs as well as integrating a price structure for the students while offering reduced or free tuition for the economically disadvantaged. There are many summer camps in Lagos that focus on the creative arts, we are however unique because of the emphasis on access and equity for all. Our program model foregrounds the necessity of diversity and inclusion by serving public and private secondary school students. We are also in the process of reconfiguring our program model to incorporate more technology and hands-on experiential knowledge. We plan to expand the camp into a four-week residential summer experience for students across Nigeria. We also intend to implement an internship or apprenticeship component, which will provide interested students with hands-on experience. Lastly, we hope to transform the summer camp program into a premier secondary school for the creative arts for students across the continent and the Diaspora within the next seven to ten years. One of the main challenges that we face as a nonprofit is in regards to the funding and sustainability of the program. Traditionally, nonprofits rely on individual donations, corporate donations, and grants. These methods can be very difficult especially for smaller nonprofits. Consequently, we are looking beyond these methods and thinking more creatively about new processes that can be integrated and implemented, to ensure the long-term sustainability and growth of the organization. What five (5) things have you learned since starting this idea? Value people. Businesses are only as good as the communities they impact and the communities who support them. No experience—good or bad—is ever lost. Remember that it is just an opportunity that life presents for growth, personal or organizational. Value Hard work. Your gifts alone will not make room for you. But your gifts and hard work will make room for you. Be humble. True leadership is not about power. It is about service. It is about having a heart for people in need and caring about their stories. Self-care is necessary. Knowing when to step away for some time will make you more productive. What five (5) things do startup entrepreneurs need to know? Network, Network, Network! Startup entrepreneurs need to become expert networkers, who confidently seize every opportunity to build meaningful relationships. Seek knowledge. Seek knowledge and inspiration because this process will help you to refine your ideas. Keep the big picture in mind! In the startup phase, it is very easy to get bogged down with tiny details that come with building something new. Although focusing on the details are important, you should also remember the big picture, as it will serve as an overall filter for you. Be flexible and open. Flexibility is key especially when you are working with a team of people. You cannot do any of this alone. It is important to make sure that people have a voice and their voices are heard, listened to, and valued. Being open ensures that your team members play an integral role in helping you to actualize your vision. Be fearless. Do not let the fear of rejection or the unknown, limit you before you even start. Once you start, do not let fear stop you from achieving your mission. Have faith and be confident in your purpose as an individual and in your organization’s mission to society. Start small, think big. Identify the core aspects of the idea and begin with that. You will be surprised at how far that will take you. African youths can support one another by creating collaborative communities where resources, expertise, and inspiration can be shared. We have created about 20 jobs so far. Technology is integral to our business. Operating with a small team requires that we make efficient use of our time. With technology, we are able to save money by utilizing user-friendly platforms or outsourcing to freelancers for more skilled work. Our website and social media platforms has been instrumental in raising awareness for our brand. By passionately and intentionally pursuing our purpose in service of the African Continent. No contribution is too small or insignificant.